Each quarter, visitors to either our Head Office in Earl Shilton or Barwell branch are being asked to choose which of two locally-based worthy causes they would like to see receive our support, as part of our In the Community token collector scheme. 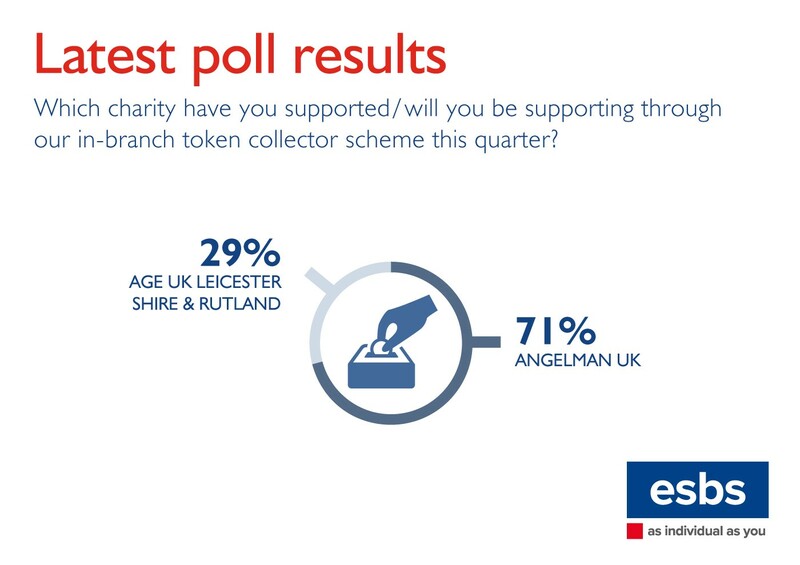 The collectors, which are installed at both branches, give people the chance to choose their preferred organisation by placing a token into the corresponding box. Once all the tokens have been counted, a total of £500 is split proportionately between the two. For example, in the first quarter, £269.14 was donated to Leicestershire & Rutland Blood Bikes, with the remaining £230.86 going to Action Homeless. For the second quarter, the two nominated causes are Age UK Leicester Shire & Rutland and Angelman UK, a nationwide charity supporting people living with the rare genetic condition and their families. With voting now open, we decided to ask our website visitors which of the two they had chosen, or which they intended to choose, as part of our website poll for March. The vast majority of those who took part said they had supported or would be supporting Angelman UK, with 71% of the poll going to them. Meanwhile, 29% had decided that they would most like to see Age UK receive backing, or that they planned on voting for them the next time they visited us.